Is Your Kitty A Shoulder Cat? 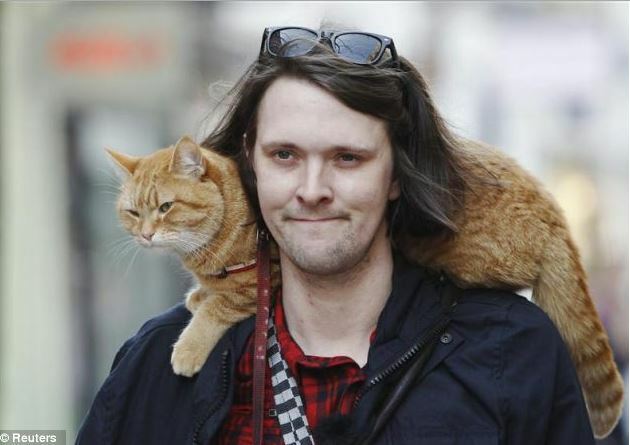 Shoulder cats tend to have distinctive, big personalities, like Bob the Cat, who felt himself right at home on the shoulders of author James Bowen. They attract attention. 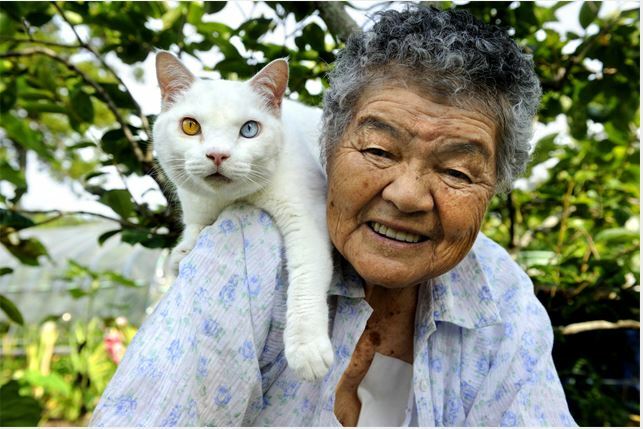 Japanese grandmother Misao and her cat Fukumaru are famous around the world for their special bond. Then there was the stray cat who got lots of attention when he climbed up on the shoulders of HLN reporter Nicole Didonato while she was doing a live report on the street. Some prefer to drape themselves on your shoulders, while others like to stand. 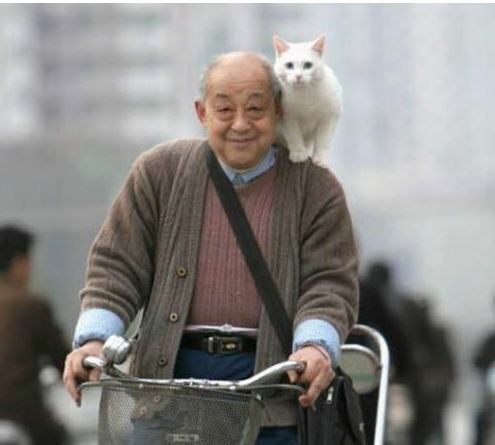 Some even ride on their owners’ shoulders while they walk down the street or ride a bike. 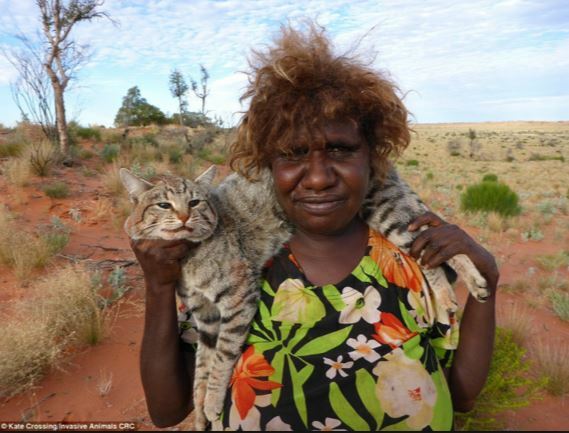 And photos like this one, in which a wild cat drapes itself on the shoulders of his companion, an unidentified Aboriginal woman of Western Australia, suggests there’s something innate about this particular bonding behavior. Shoulder cats tend to be outgoing and confident. They like a ride, and they may sometimes use you as a convenient perch to get a better look at the world. Most are profoundly affectionate. They love intimacy and can’t get enough of you; kitty Mary Jane is one of those. She likes to ride on Rudi Saldia’s shoulders while he works as a bike courier. 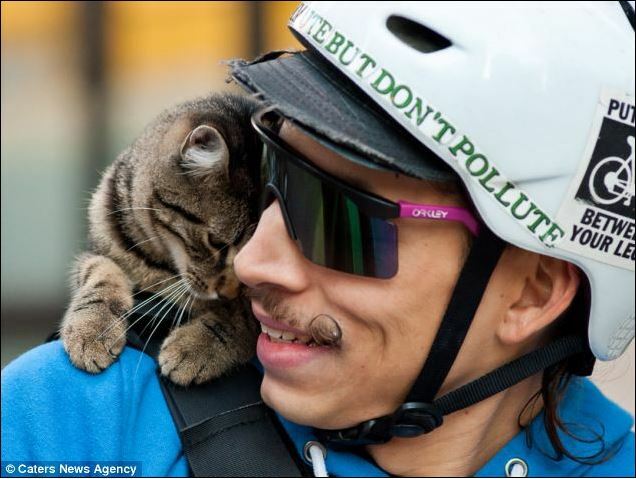 If you have a photo of you and your shoulder cat, please share. We’d love to see it. Feral cats are a massive problem in rural and outback areas. There is a decent economic incentive for people to hunt them, and (particularly) for indigenous women it is often a good use of their existing skills and free time- hunting any game larger than goannas is typically restricted to men. 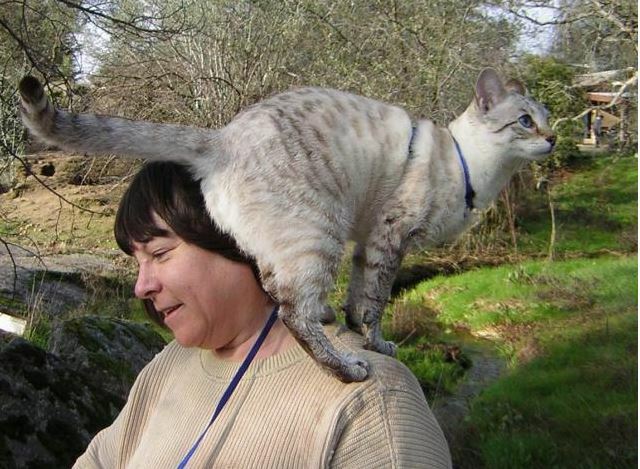 Shoulder cat training: have you thought maybe using a device that would help to keep the cat on your shoulders? Like a backpack of sorts for support? I have a new shoulder cat by the name of Bronco. He’s great! I use the device that helps to keep him stable on my shoulders. Love those pics! For some reason a few months ago our 2 year old Russian Siberian, who btw is 15 pounds and super long started climbing up our shoulders and doing this! Its kinda weird cause all he does is just hang in there. Sometimes he does a scarf wrap around but most of the time he lays over our shoulder, half his body facing our back and then his little legs dangling over our chest, funniest thing ever! I recently adopted two kittens and discovered they were both shoulder cats. It gets hard a times since they both perfer my left shoulder and like to race to it. Most of the time it’s cute, though! Our kitten Tiddles loves nothing more than to fall asleep on my shoulder, he spends most of the day there! Too cute ??? My cat Misty will sit on my lap then stand on her hind legs to either decide if she’ll jump on my shoulder or lay back in my lap. My kitten first did it at the vet when she was scared. Now she just likes to chill there a few times a day especially when im doing my biz on the toilet. TMI sorry but it’s relevant. Her routine is to headbunt my pants for a few and then leap up and take a nap. Only downside is there have been times she jumped up when I didnt have a shirt on and wasn’t expecting her. Painful to say the least but I find it nearly impossible to get angry at her. I’ve just got my kitten Blackjack, about a week ago, and he absolutely loves to sit on my shoulders or chest and nuzzle his head into my neck, and fall asleep. Unfortunately he was the runt of the litter and is very tiny for 9 weeks old. But he is a very affectionate Tom cat. Blackjack, has also started to lick my face, and rub his face up against me. I hope that he continues to sit on my shoulders, as we have made a special connection with each other in the last week.